Dear Michael L., We very much appreciate your comments regarding your stay at the Sofitel Marrakech Lounge & Spa. It is always a pleasure to receive positive feedback. I will share your comments with our team. I am sure that this feedback will serve as an encouragement to all of our staff as we strive to continuously improve the quality of our services. Thank you again for sharing your experience, and we hope your next visit will be as pleasant as the previous one. Sincerely, Ahmed BENKIRANE Directeur Général. Dear adams s., We very much appreciate your comments regarding your stay at the Sofitel Marrakech Lounge & Spa. It is always a pleasure to receive positive feedback. I will share your comments with our team. I am sure that this feedback will serve as an encouragement to all of our staff as we strive to continuously improve the quality of our services. Thank you again for sharing your experience, and we hope your next visit will be as pleasant as the previous one. Sincerely, Ahmed BENKIRANE Directeur Général. Staff was really very good and the service was fabulous, i would like to thank hicham redouane rachida fatima and majda. The location is very good, walking distance to many attractions, restaurants, markets and shops. Rooms were clean. Dear Henry H., We very much appreciate your comments regarding your stay at the Sofitel Marrakech Lounge & Spa. It is always a pleasure to receive positive feedback. I will share your comments with our team. I am sure that this feedback will serve as an encouragement to all of our staff as we strive to continuously improve the quality of our services. Thank you again for sharing your experience, and we hope your next visit will be as pleasant as the previous one. Sincerely, Ahmed BENKIRANE Directeur Général. Reception - I was promissed that a room of a member of the group will be changed ( after a mistake of the hotel, giving a twin room, eventhou a double room was booked in advanced),and I needed to followup this request 3 times untill it fullfiled. The stuff of the dining room (Fatima - making with a smile amazing Mesimna), Yoossef - where excellent!!! Dear O. H., We very much appreciate your comments regarding your stay at the Sofitel Marrakech Lounge & Spa. It is always a pleasure to receive positive feedback. I will share your comments with our team. I am sure that this feedback will serve as an encouragement to all of our staff as we strive to continuously improve the quality of our services. Thank you again for sharing your experience, and we hope your next visit will be as pleasant as the previous one. Sincerely, Ahmed BENKIRANE Directeur Général. Superb! What a beautiful hotel !!! A perfect service, a very nice welcome, and beautiful rooms and very well equipped ... In the historic district, it's a real palace, an unforgettable stay ... The breakfast is perfect. I want to thank the director Mr Benkirane and also brahim, ghali, said, fati, chief momo, Hamid and Zidane, idbouhdou, sigma, hanane of room service. Mehdi and taha from the front desk. karima and spa majdouline Thanks. Dear li z., We very much appreciate your comments regarding your stay at the Sofitel Marrakech Lounge & Spa. It is always a pleasure to receive positive feedback. I will share your comments with our team. I am sure that this feedback will serve as an encouragement to all of our staff as we strive to continuously improve the quality of our services. Thank you again for sharing your experience, and we hope your next visit will be as pleasant as the previous one. Sincerely, Ahmed BENKIRANE Directeur Général. Dear Maather A., We very much appreciate your comments regarding your stay at the Sofitel Marrakech Lounge & Spa. It is always a pleasure to receive positive feedback. I will share your comments with our team. I am sure that this feedback will serve as an encouragement to all of our staff as we strive to continuously improve the quality of our services. Thank you again for sharing your experience, and we hope your next visit will be as pleasant as the previous one. Sincerely, Ahmed BENKIRANE Directeur Général. Pleasant stay and Amazing experience !!!!! 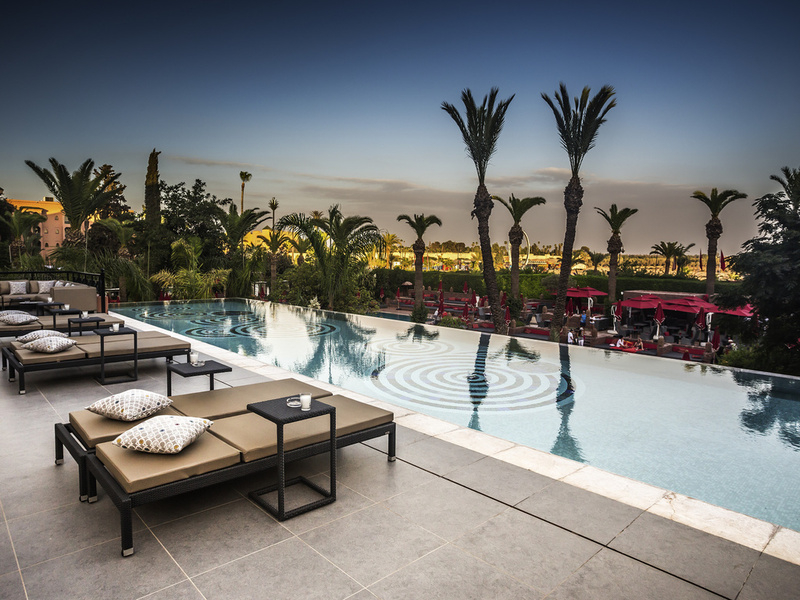 Exceptional Sofitel Marrakech, service at a beautiful property. Personnel were warm, friendly and very helpful. We dined one evening in the Moroccan restaurant and the food was excellent. Each morning we had the buffet breakfast, and while a bit pricey, was an outstanding array of quality food , thanks to Chef Momo, chef Ahmed & ibtissam. The Pool & SPA was excellent, Karima Majdouline and Amal were fun and enthusiastic, Abdessadek , the coach was always present and very helpful, thanks again . Really I enjoyed my stay, the warm welcoming, the process of check in, hospitality, kindness of staff, the hotel condition, the quality of food, service, the helpful concierge, and more, Hanane and Taha were all excellent Thank you to all the staff for making our stay so special and would highly recommend for a stay in Marrakech. Dear prinz anton l., We very much appreciate your comments regarding your stay at the Sofitel Marrakech Lounge & Spa. It is always a pleasure to receive positive feedback. I will share your comments with our team. I am sure that this feedback will serve as an encouragement to all of our staff as we strive to continuously improve the quality of our services. Thank you again for sharing your experience, and we hope your next visit will be as pleasant as the previous one. Sincerely, Ahmed BENKIRANE Directeur Général. This is an amazing hotel, relax, quiet and comfort. I liked so much breakfast and the view of hotel. It's a very good place to stay in Marrakesh. All services are good. It's big and super hotel. The staff is world class, I would like to thank rachida anas hicham fatima assia abdelhak. Only one thing that i didn't like is the temperature of pool water, not too much bad, but i would prefered a little bit hot. thanks for hospitality. Hotel and environment was absolutely wonderful. Our room was nice and clean and the staff was very friendly. Thanks to rachida hicham fatima nassira and salah. We also enjoyed the hotel bar as well. Dear Mary S., We very much appreciate your comments regarding your stay at the Sofitel Marrakech Lounge & Spa. It is always a pleasure to receive positive feedback. I will share your comments with our team. I am sure that this feedback will serve as an encouragement to all of our staff as we strive to continuously improve the quality of our services. Thank you again for sharing your experience, and we hope your next visit will be as pleasant as the previous one. Sincerely, Ahmed BENKIRANE Directeur Général. The staff was great the room was refined the breakfast wonderful .felicitations: chef momo, zaizi, quorfi, ghali, lachheb, zidane, rachida.zinedine and atoul from room service karima , abdessadek,yosef ,Amal fatim Zahra and majdoulin from spa, ahmed and um from the front desk. the location very well the price is the delivery I recommend it. Dear bullet y., We very much appreciate your comments regarding your stay at the Sofitel Marrakech Lounge & Spa. It is always a pleasure to receive positive feedback. I will share your comments with our team. I am sure that this feedback will serve as an encouragement to all of our staff as we strive to continuously improve the quality of our services. Thank you again for sharing your experience, and we hope your next visit will be as pleasant as the previous one. Sincerely, Ahmed BENKIRANE Directeur Général. Several stays at the Sofitel. Always a warm welcome and attentions (pastries, fruit in room, thank you to Yassine, Chardoud, Idbouhdou, Zidane, Anoir, Soufiane. Personal welcome at the reception thanks to Abderahim, Amani, Ahmed and Taha). Very warm welcome at the spa and especially the yousof and majdouline, also coch abdou., Congratulations for the variety of savory and sweet dishes at the orangery thank you kebir and atika. A breakfast by the pool always magical with a wide choice and quality products. A big thank you to all and above all: (zanti, chef momo, quorfi, chef zaizi, ouchinah, ghali, reda) As for the pool always beautiful, welcome always with enthusiastic and friendly team thanks to abdelilah and younes the manager. In short, see you soon! Dear n. t., We very much appreciate your comments regarding your stay at the Sofitel Marrakech Lounge & Spa. It is always a pleasure to receive positive feedback. I will share your comments with our team. I am sure that this feedback will serve as an encouragement to all of our staff as we strive to continuously improve the quality of our services. Thank you again for sharing your experience, and we hope your next visit will be as pleasant as the previous one. Sincerely, Ahmed BENKIRANE Directeur Général. Stay was OK, not 5 star at all even the junior suite was worse than the regular room, broken shower tubes caps and unclean. Lights too dark and hairdryers are extremely old and poor and it takes hours to get a new one. Pool is nice, Spa is good as well. Gym is not nice too small and smells bad. Staff some are great some need to smile more often. Our favorite staff was Soufiane. Dear ABDEL N., Thank you for taking the time to tell us about your experience at the Sofitel Marrakech Lounge & Spa. I am sorry that your experience did not meet your expectations; please allow me to express my sincerest apologies. At Sofitel Hotels & Resorts, we strive to provide a superior service experience for every customer; therefore your feedback is very important to us. Please rest assured that we are taking the appropriate measures to address the problem and prevent future occurrence. We appreciate your sharing your concerns, and it is our hope that you will give us the opportunity to better serve you in the near future. Sincerely, Ahmed BENKIRANE Directeur Général. We had an excellent time in the hotel. Our room 264 was perfect, the choice of breakfast food was the best we have ever experienced. We arrived late on Sunday 3 March and dined once for dinner - which was fine. What we loved above all were the smiles of ALL the staff - we were made truly welcome. Dear Tony O., We very much appreciate your comments regarding your stay at the Sofitel Marrakech Lounge & Spa. It is always a pleasure to receive positive feedback. I will share your comments with our team. I am sure that this feedback will serve as an encouragement to all of our staff as we strive to continuously improve the quality of our services. Thank you again for sharing your experience, and we hope your next visit will be as pleasant as the previous one. Sincerely, Ahmed BENKIRANE Directeur Général. we stayed in this beautiful hotel. The welcome and the benefits are up to a five-star. Kindness and services seem to be the key words. If the opportunity arises again, we will return with pleasure. We especially thank Chef Afra, Chef Moumo, Chef ibtissam, managers: Ghali, Ibrahim for breakfast. Zidan at the room service that pampered us as well as Sadeq sports monitor, Karima and youself at the Spa. A wink to Zanti at breakfast, so nice and whose smile. Institution to recommend. I felt as if we were an inconvenience to everyone except for the woman that cleaned the room. After we moved rooms because the first room smelled of lacquer, the room was very nice, excellent pool view, nice amenities, but, the bed looked as if it had a rolled up bedspread in the middle the divots on either side were so big. ANYTIME we tried to get something at either the bar or pool, we felt as if we were putting the wait staff out. We had 3 nights in the sofitel marrakech and we had a really nice time. All the staff are very friendly and helpful. The hotel is very clean, rooms are big.thank you assia Karim nouihi Brahim. Stayed at the Sofitel Marrakech Palais Imperiel; the double deluxe rooms were very comfortable, classically decorated and well equipped. However, soft-furnishing in areas need refurbishment. Very high standards of catering provided - exceptional breakfast served in delightful surroundings with friendly and helpful staff. Food at hotel's L'Orangerie restuarant was Michelin standard with excellent live music by the local live &quot;jazz&quot; band. Staff serving for breakfast and dinner need particular mention for their high standard, efficient and friendly service: the following staff members stood out: Mokhtar ( pool area ) and Wiam, Soukeina, Majdo, Siham and Atika for the service they provided. Guided excursions arranged through the hotel didn't disappoint either - provide some memorable day outs. since I became French honoray consul I have used a lot of AccorHotels, in particular Sofitel, in Philippines, Laos, Thailand...and always been satisfied. The same goes for Sofitel in Marrakech. It it your staff that makes the stay agreeable: I could write a long list of names here of people really making the stay unforgettable. A young lady at the reception, Lamia, is a true ambassador of Sofitel; we felt so welcome from the very beginning when she took care of us. Another gem was one of the waiters at the pool, Mouhsin. He was a bit more serious than most of the others..always polite and took care of us in an exemplary manner. Great Service.